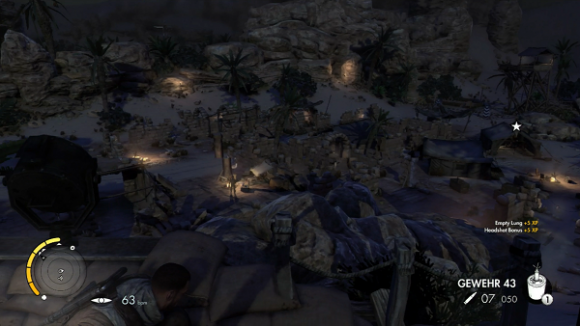 Sniper Elite v2 did a lot of things right at its release back in 2012. There was simple delight to be had in watching a bullet travel three or four hundred yards before ripping through bone and tissue, all in the name of saving Europe from the Nazis. The problem was that although the sniping was great, everything else floundered. The stealth was never particularly good as it was hard to gauge when you would be instantly spotted and when you would not. The AI, on being alerted to your presence, would adopt one of two routines: either run down the very linear, corridor-driven level design straight at you or instead crouch behind cover for a bit and then occasionally pop their heads up, allowing you to get a glorious slow motion sniper kill. This one note AI and level design reduced the game to being a shallow but fun romp that was made even better by playing in Co-Op, and I pretty much said as much in the preview a few years ago. 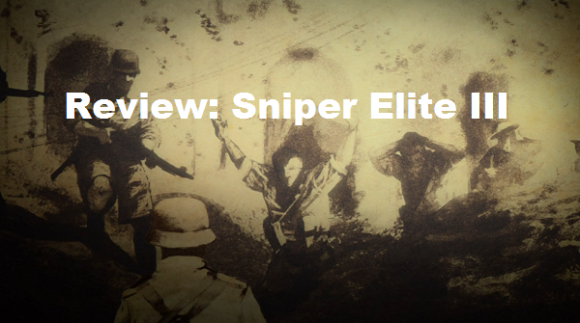 Sniper Elite III improves on its predecessor in every respect. Starting from the tutorial mission it is already clear that the level design has had an overhaul; the objectives are now less sequential and it encourages the player to use the large levels to negotiate their own paths to them. Some of the later levels are huge, sprawled over multiple tiers and with various hidden objectives such as getting through areas undetected or destroying all enemy weapon caches. These not only encourage exploration and extra playthroughs but also the earlier levels teach you some of the fundamentals of the game, like placing dynamite or performing stealth kills. The same goes for the combat: with the more liberal use of sniper shot muffling devices (ringing bells, sabotaged engines etc.) and clearer, more comprehensible alert states – a dial appears above your head cycling through the white, yellow and then red to let you know how much trouble you are in – it is more feasible to circumnavigate levels without alerting all involved. For their part, the enemies are also more intelligently designed, with some resetting their caution state back to a standard patrol when they find nothing, while others are quicker to be alarmed and will continue to search for you long after the rest of their outfit have given up. Once firefights start the enemy will try and suppress, flank and even chase. There are certainly limits to the soldiers’ routines and they aren’t brilliant at finding their way to the player but it still feels frantic and unpredictable once the shooting starts, rather than rote as v2 often found itself. Co-Op play is still available through every campaign mission, and with the far more open level design it allows for two players to split up instead of stumbling over each other, unlike the more claustrophobic feel of previous games (sadly, co-op is still an online only affair, unlike the split screen mode of the original game). As a result it’s even better this time round and I cannot recommend it enough. 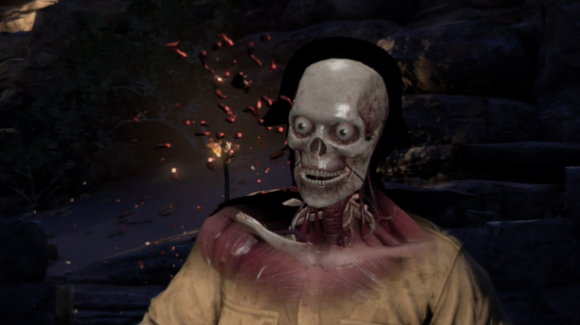 Sniper Elite III allows for some truly fun, emergent co-op moments. Late in the game, the two of us managed to sneak through a winding group of tunnels using the noise of overhead planes to stealthily take out guards, quickly relocating if we were spotted or holding pitched battles with machine-guns when we were pinned down. We finally found our way to an old temple with five enemy troops protecting one of the objectives. After taking them all out using some well-timed synchronised execution shots, I set up a perimeter of trip wires and landmines as my partner explored the temple. I was expecting something to attack us but, instead, a Panzer tank drove into the canyons outside the temple and proceeded to stalk us, blowing up the mud buildings I was skipping through to get away from it in the process. After finally losing the tank I managed to get up onto a ridge while it was distracted and then successfully snipe its petrol tank. As I was celebrating my victory, a half-track rolled into view loaded with more enemy reinforcements. It drove straight over a mine I had laid earlier. Sadly, there are some elements that are at odds with the rest of the game. Primarily the scoring system that pops up every time you kill anything. This may have been put in place to encourage more efficient use of weapons and techniques, but it is tied into a levelling system that encourages sniping for the most points – which isn’t always conducive to the best way to play through the level. Likewise, there are points where the game forces you to start shooting, turning the game into a glorified Duck Hunt that slightly undermines the game’s endeavours to offer the player the freedom of choice to engage with the game in the way that they want. All that written, these are minor qualms and the game is still ridiculously good fun regardless of your choice of platform. Given the advances that Rebellion have made since the last iteration, I look forward to seeing what they do next with the Sniper Elite series. Sounds like v3 has done a great job addressing all of those and opening up into one of those fairly freeform co-op experiences we enjoy so well. I really wanted to play this on Xbox One but Hurry doesn't have one for the Co-Op element. No worries though dude. I'm sure I'll either nab it on PC for cheaps or find a reasonably priced copy for consoles when I'm buying new(ish) games again. Definitely think the co-op sounds like an important part of it.